The Iridium GO! 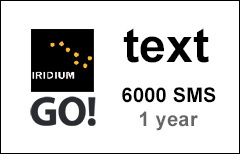 6000 SMS, 1-year voucher can be used to renew your Iridium GO! Text prepaid account. Iridium GO! Text vouchers are NOT compatible with the GO! 400-min or 1000-min data plans, so this voucher shouldn't be purchased to reload the other GO! plans. Before applying any GO! Text voucher on your existing Iridium prepaid account, your current plan will be deactivated and all unused minutes and validity time will be forfeited. By purchasing and applying this voucher you confirm that you have read and accepted this condition. Upon expiration or depletion of the GO! Text voucher, your account can be renewed with another GO! Text voucher (3000 or 6000 SMS) or can be converted to another Iridium prepaid plan. All unused minutes will be lost after expiration or upon conversion to the other account type.